Jammu and Kashmir constituted State Advisory Board for the Development of Pahari Speaking People invites applications for Post Matric Scholarship 2018-19. Students belonging to Pahari Speaking People Category of J&K State pursuing studies within & Outside the State of Jammu & Kashmir in Government/ Government Recognized Educational Institutions undergoing above 12th class, Diploma courses, Graduation/Post- Graduation Level Courses, B. Ed, M. Phil, Ph. D & Professional/Technical Degree Courses at Graduate and Post-Graduate Levels are eligible to apply. Step 2 : New User click on the “Register” button in the menu bar. Step 4 : After registration you can login with your Login Id & Password. 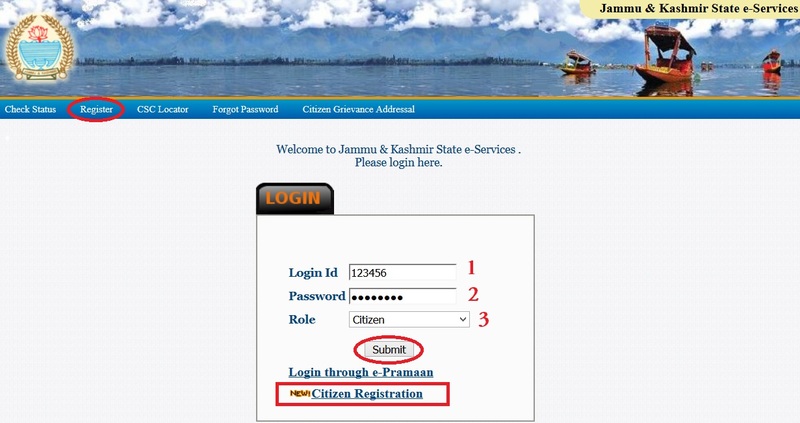 Please select the role type Citizen while entering login credentials by the Applicant. 1. The applicants are advised to take print-Out of the duly filled-in application form, after submitting it on-line and submit the same to the Concerned institution/College/University along with all requisite documents. 2. 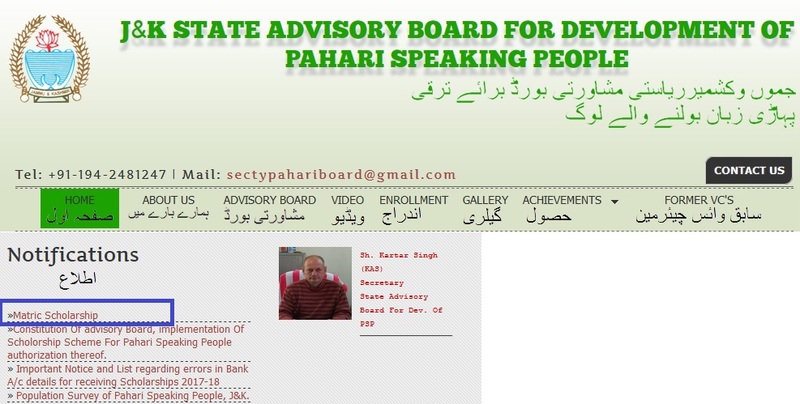 The Concerned Head of Institution/College/University will verify the on-line Applications with hard copies and forward the hard Copies to the State Advisory Board for development of Pahari Speaking People for further scrutiny/verification and maintain record of students who have applied for scholarship for further reference. ** One Passport size photograph. ** Permanent Residence Certificate (State Subject Certificate). ** Marks Sheet Of previous class passed. ** Attested Fee Structure duly approved by Central/state Government (in case of Private recognized Institutions). ** Parents/Guardians Current income certificate, in Original, from the Concerned Tehsildar (in Case of Students Whose Parents/guardians are not Government employees). ** (Valid) Category Certificate (Pahari Speaking Category) from the Tehsildar Concerned. ** Aadhaar Number along with Xerox of Aadhaar Card and seeding of Aadhaar with bank account will lead to smooth transaction of sanctioned amount of scholarship in favour of eligible students. ** Mobile Number is Mandatory. ** Preference will be given to the Government Institutions. ** Scholarship will be restricted to availability of funds and also the merit and income. ** A Scholarship holder under this Schemes will not avail any other scholarship/stipend for pursuing the same Course class from any other Agency/Department. Submission of hard copies of online applications along with all required documents to concerned Institute – 4th January 2019. I also applied for 2018-19 Post Matric Scholarship under Pahadi speaking category for the course LLB. I am pursuing in Kashmir University. After submitting the online form, I took out the print & verified the same from HOD. But they didn’t keep the hard copy & Instructed me to forward the same along with required documents to the concerned advisory board. Now how long it will take to get the scholarship disbursed? Please tell, when the Pahari scholarship will be deposited in the concerns account. From where should the concerned college verify this form (or) forward this form this form? Please guide us. An error is occurred during online submission by computer operator that the fee is refundable which is actually non refundable and My last degree is MA which is not mentioned but I attached the hard copy of it along with application. Please rectify the same. Pahari scholarship online application last date is 25th December. Please intimate if there is any extension in last date and when the admit card will be available? I am unable to upload the document which are less than 250 KB (or) more than 250. What type of document do we need to upload there on the site? Now the site has changed the criteria to upload the document. What to do? You need to compress the size of that file like 40kbs each and then upload. We don’t have any fee receipt for 2018-19 session and Waiting for admission. I am a student of SP College and waiting for admission in final year which starts from 12th December 2019. And here your board has given us the timeline for submission the form is 10th December 2019. So my request to Oahari board, kindly extend the date. I applied for last year (2017-18) scholarship but I have not received it yet. My last year application is still under processing. Please help me to resubmit the scholarship form. Forget that and submit new.